All sales end Jan 1 2014! 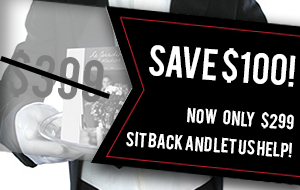 Rather than just do a one day sale, we decided to end the year with a month of savings! We want to help you get your site looking it’s best, so we have cut the price on customization and White Glove service. Both of those are first come first serve, so sign up fast so we can book your spot now! 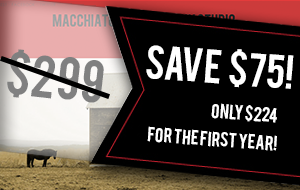 Save $75 on the first year! Still playing with the free trial and deciding whether to make the move? Start a new BlogSite now and get our best deal ever on a new site! $224 for the first year! 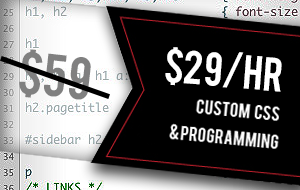 Save over 50% on Custom CSS! We want to help you look your best for the new year! You might be surprised what an hour or two with our team can do for your site! $100 off White Glove Service! With our White Glove service, we will setup your site for you! We can resize images, add content, customize contact forms, and you get to sit back and do what you do best! 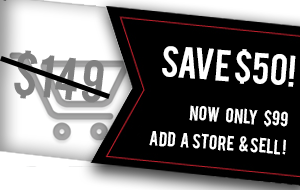 Add a store for only $99! For a one-time price, you can add a fully functional e-commerce store to any site! Sell digital downloads, physical products, variable products, and more!